Esther "Star" Svensdotter’s job is overseeing the completion of the American Alliance’s first O’Neill cylinder - a massive space hub capable of supporting thousands of colonists. It’s just weeks away from commissioning, and she’ll be damned if Luddite terrorists, squabbling bureaucrats, military takeovers or rogue AIs will stand in the way. Frontier justice on Ellfive sometimes involves an airlock - you don’t want to be on the wrong side of justice. Or the wrong side of Star Svensdotter. 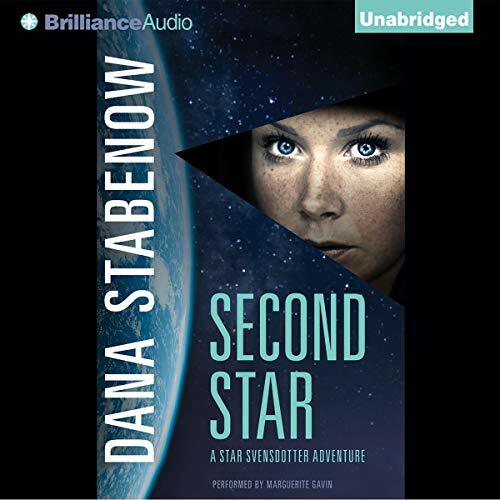 The first in Dana Stabenow’s Star Svensdotter trilogy, Second Star is a tale of first contact, declarations of independence, and new frontiers. ©1991 Dana Stabenow (P)2011 Brilliance Audio, Inc.
Stabenow worked hard to get some good science into her fiction. The influence of Heinlein on both plot device and characterization is strong, but the females in the story are given a more satisfactory personality than Heinlein usually did. It seems clear that the succeeding novels are being prepared for in this tale, although it is good in itself. I ended up listening to three quarters and reading the last quarter in e-text, since it was free. Both media compelled my interest. When does the next one in the series come out???? Yes I would recommend it...I have been waiting and hoping for this series to come out, and to have Marguerite Gavin as the reader was wonderful (I love her reading of the Kate Shugak books). What was one of the most memorable moments of Second Star? I want to be able to fly like the characters on EllFive!!! The scene where Star, Caleb, Elizabeth, and Paddy launch themselves off the mountains of EllFive (with their strapped-on wings) was wonderful. Yes, I have listened to all of her Kate Shugak performances, and this is just as wonderful as those. She doesn't over-emote, but gives just the right amount of feeling, and doesn't fall into the trap many readers have of reading as if the listener needs a massive amount of help from his/her voice to decide what to feel at any particular point. I highly recommend anything by Dana Stabenow. Her three SF books didn't make much of a splash when they were first published, but I have worn out several copies of each, and I am pleased to now have the Audible version of the first in the series. What did you love best about Second Star? I am a Dana Stabenow fan. This was one of her first books. You can tell she did a lot of research to write such a compelling story. If you are a Sci Fi fan this is a very believable story of what Earth's future could be. You can also see her progression to the Kate Shugak series. It is good to see that the other two books in this series are coming out in April and May. What a great series. What other book might you compare Second Star to and why? To Dana's Kate Shugak series, you can see her progression as a writer. Which character – as performed by Marguerite Gavin – was your favorite? Would you recommend Second Star to your friends? Why or why not? I purchased this book because of the quality of the author's Alaska books. It's a tedious book, and nowhere near the detailed quality of the two Alaska series. Not a bad buy for 5$ or less, but otherwise forgettable. Most of the quality of the book comes from the narrator. Dana's 1st. Love her writing style! Dana never ceases to keep me entertained. The velvety voice of Marguerite is amazing. I secretly hope for a fourth Star. It was not boring! 😀 Left me wanting a sequel! loved how big the space station felt. Given that I grew up in the days when the Russians (or Soviets) were a driving force, this novel felt familiar. This is basically an alternate future book, where a message from space shows that Aliens are out there and motivates the world to head outwards to greet those aliens on a more equal footing. Star is basically a construction manager / captain of the still developing L5 community being put together by the Western alliance (US, Japan, Mexico, Canada) on a grand scale (miles long rotating habitat meant to house 1 million people? That's the definition of grand scale!). Of course, there are a lot of issues. The potential of a hostile takeover, construction delays, solar flares and, yes, aliens all make this book an entertaining read. Amazingly for a book written 2 decades ago, the book holds up fairly well (other than the geo-political aspects). I had to go back see when it was written and was quite surprised at the date. I would not hesitate to recommend the book. I would not hesitate to recommend Ms. Gavin's narration with the following warning. Either Ms. Gavin or her editor should be far more vigilant about finding out the way to correctly pronounce common scientific and mathematic terminology. It grates to hear words mispronounced when we all know it is possible to find out the accepted way to say all terms...it just take a layer of caring about the product which I have never encountered before in this narrator's performances. Ms. Gavin, the pleasure of listening to your nuanced characterization does not deserve to be reduced this way! If you enjoy Dana Stabenow's Kate Shugak and Liam Campbell, wrench yourself away from the wilds of Alaska and try a yarn set in a fabricated space ecosystem. Early chapters, yet, but thus far similar to early Heinlein. I will repeat that I do not think the blame for narration errors in a single person's error!